1. General Appearance: The Irish Wolfhound should not be quite so heavy or massive as the Great Dane but more so than the Deerhound, which in general type he should otherwise resemble. Of great size and commanding appearance, very muscular, strongly though gracefully built, movements easy and active; head and neck carried high; the tail carried with an upward sweep with a slight curve towards the extremity. 34 inches (86cm) in dogs, showing the requisite power, activity, courage and symmetry. 2. Head: Long, the frontal bones of the forehead very slightly raised and very little indentation between the eyes. Skull, not too broad. Muzzle, long and moderately pointed. Ears, small and Greyhound-like in carriage. 3. Neck: Rather long, very strong and muscular, well arched, without dewlap or loose skin about the throat. 4.Chest: Very deep, breast, wide. 5.Back: Rather long than short. Loins arched. 6.Tail: Long and slightly curved, of moderate thickness, and well covered with hair. 7.Belly: Well drawn up; the male with apparently two normal testicles descended into the scrotum. 8. Forequarters: Shoulders muscular, giving breadth of chest, set sloping. Elbows well under, neither turned inwards nor outwards. Leg: forearm muscular, and the whole leg strong and quite straight. 9. Hindquarters: Muscular thighs and second thigh long and strong as in the Greyhound, and hocks well let down and turning neither in nor out. 10. Feet: Moderately large and round, neither turned inwards nor outwards. Toes, well arched and close. Nails, very strong and curved. 11.Hair: Rough and hard on body, legs and head; especially wiry and long over eyes and under jaw. 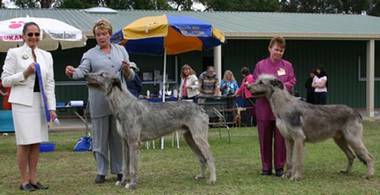 12.Colour and Markings: The recognised colours are grey, brindle, red, black, pure white, fawn, or any colour that appears in the Deerhound. 13. Faults: Too light or heavy a head, too highly arched frontal bone; large ears and hanging flat to the face; short neck; full dewlap; too narrow or too broad a chest; sunken or hollow or quite straight back; bent forelegs; overbent fetlocks; twisted feet; spreading toes; too curly tail; weak hind-quarters and a general want of muscle; too short a body; pink or liver-coloured eyelids; lips and nose any colour than black; very light eyes. The above is, more or less, the original Standard of Excellence formulated by the Irish Wolfhound Club, with the addition of a few small points - such as the light eyes as a fault - at later dates. The Irish Wolfhound Club has since deleted mention of the Great Dane.